We have noted with concern the comments made on various posts about fake news. Some comments include listening to the whole budget speech and not finding any reference. 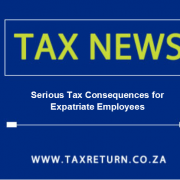 Our only intention is to share the correct tax position, to allow proactive planning (as various legitimate planning opportunities will remain viable, through using international tax law, which SARS cannot legislate against) for affected South African expatriates abroad. 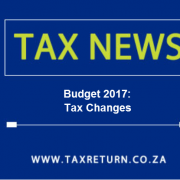 The budget speech contains various tax technical proposals. These are obviously not verbally announced, but they are still published with the speech. If you deal with tax, you will know they are the pre-cursor to law, and whilst not promulgated yet, the law process logically follow, as a policy decision has been made. For those who wish to validate as authentic. See http://www.treasury.gov.za/. Go to Budget 2017. Please note the actual law amendment has not been drafted. Also, there is very good international tax planning which can be done to minimize your tax position, whilst remaining fully tax complaint. We will do additional updates as the law is published and to recommend tax planning and compliance considerations. Objections and Appeals: The Helpless Taxpayer? 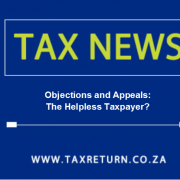 OBJECTIONS AND APPEALS:THE HELPLESS TAXPAYER? There is probably no-one more unhappy about the budget speech announcements than expatriate employees to Dubai. The source of directors fees are considered to be where the head office of the business is located. Therefore, where the directorship is South Africa, the source is South Africa. See for example ITC 77 (1927) 3 SATC 72; ITC106 (1927) 3 SATC 336; ITC235 (1932) 6 SATC 262; and ITC250 (1932) 7 SATC 46. There is a specific Double Tax Agreement clause and which deals with directors’ fees. This clause is generally contained in Article 16 of the OECD model treaty and typical wording reads “Directors’ fees and other similar payments derived by a resident of a Contracting State in his capacity as a member of the board of directors of a company which is a resident of the other Contracting State may be taxed in that other State.” This means that the DTA does not override the source country taxing right and also that the “independent personal services” clause, with certain exemptions, does not find application. 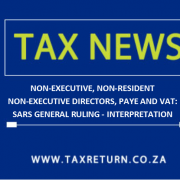 The non-executive director will have to register for VAT on a compulsory basis, where the VAT Act requirements are achieved. 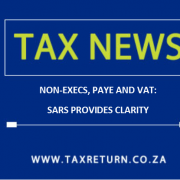 This effectively means that where the expected fees are above R1m for a fiscal year, the registration is compulsory provided there are some meetings held in SA in compliance with the definition of ‘enterprise’ in section 1 of the VAT Act. The VAT vendor must the invoice for services through the issuance of valid VAT invoices and there is normally a bi-monthly VAT compliance requirement, even where no VAT invoices was issued. There is still employees’ tax withholding on non-resident non-executive directors. The reason is that they do not fall within the exemption in the Fourth Schedule to the Act. This makes also sense logically, as SARS would have difficulty collecting from someone in a foreign jurisdiction and the tax laws are by its very design aimed at protecting our tax base. The non-executive director is allowed to claim expenses against the production of income, which can be done on personal tax assessment. There is necessarily then a refund of PAYE and to the extent which expenses are allowed. We recommend that a basic set of AFS are prepared and to support the tax filing. 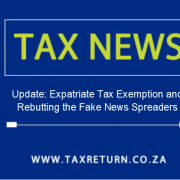 Also, a South African bank account may be opened and is very useful to receive the tax refund and a prerequisite for receiving a VAT refund. Many companies with non-executive directors who are non-resident outsource their compliance and planning to provider for an end-to-end solution, including on income tax, VAT, administration and opening of their foreign bank accounts. WHAT IS PROVISIONAL TAX ALL ABOUT? As you may have heard on the radio and television that the deadline for Provisional Tax is 28 February 2017. Provisional tax forms part of your assessed tax. It is a method of paying tax due to SARS on additional income other than your normal salary income, which is subject to withholding tax. It allows a taxpayer to make advanced payments during the year of assessment, which are based on the taxpayer’s estimated taxable income. The final tax liability is calculated upon assessment and provisional payments made are off-set against the liability for normal tax for that year of assessment. When am I liable to pay provisional tax? Additional Income earned from interest, foreign dividends and rental income will not exceed R30,000. 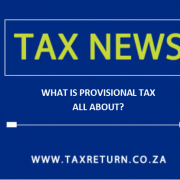 Visit our home page at www.taxreturn.co.za/provisional-tax for more details regarding Provisional taxes.